For got to take a picture of the lace before I added it to the dress but I found this old picture that has two of the laces in it the antique ones. 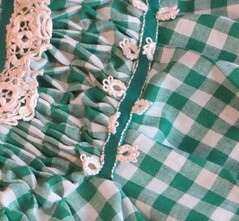 In this below photo the top most right cream Irish crochet lace is on the collar and on the far left right below the white lace with the turquoise edging is the one I used for the m hem. This photo was taken back in 2008. 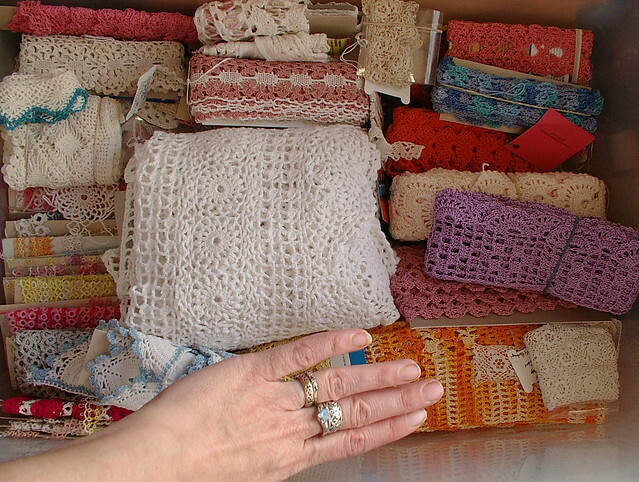 Above that is my handmade lace box where I place laces I make and laces I buy that are handmade for future use. Some of these I still have as lace and some have been all used up.. This is a 12 gallon tote so it holds a lot of lace it is about half full at the moment Some of the lace in this box my children have made as well as they were learning how to crochet, tat, or knit. Some new I made some antique given to me pretty much everything has a history I and I know them all The little tags (embroidery thread bobbins) you see attached to things is how I remember things like that on special ones. Like the ones I used in this dress they had tags on them for years so I would not just use them up because they were special and given to me out of love from my grandmother and one of her best friends. They had been in the friends family for years so I was honored when she let them leave her family line and was passed to mine. Fabulous!!! I love the addition of the lace. What a very special dress. 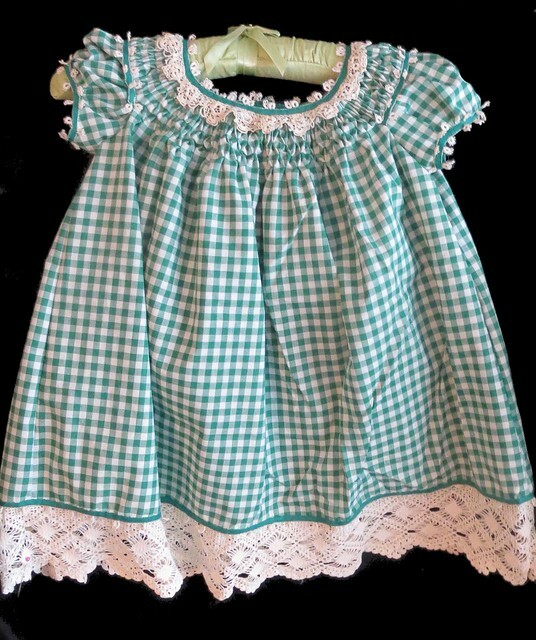 Absolutely gorgeous - guess that will get worn by all your future granddaughters in turn - what a special dress. I don't have any grandchildren yet, but I'll be ready just in case there's a girl!